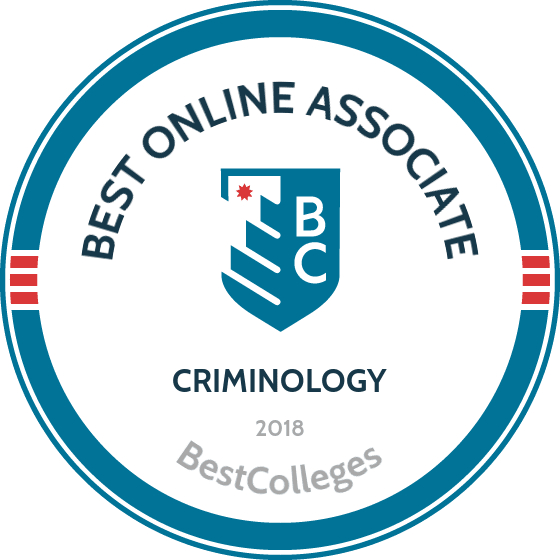 What Are The Best Online Associate in Criminology Programs? What Else can I Expect from an Online Associate in Criminology Program? What Can I Do With an Associate in Criminology Degree? An online associate degree in criminology prepares students for gainful employment and for bachelor's-level programs. The degree constitutes the first step towards a career in criminal justice, law enforcement, forensic science, homeland security, or emergency management. As our world becomes more interconnected, cybercrime and border defense grow in importance. The U.S. Bureau of Labor Statistics projects a 17% growth rate for forensic science technicians between 2016 and 2026. Many schools offer an online associate degree in criminology, which allows students to find the one that best suits their work schedule, personal interests, and professional goals. The associate degree in criminal justice at LeTourneau University is a 63-credit hour program that can be earned in as few as five weeks. Through the associate degree curriculum, students establish the foundations needed to obtain entry-level positions in the criminal justice field. The online associate degree in criminology prepares students for careers as police or corrections officer, or enables them to further their studies at the bachelor's level. Core coursework includes introductory courses on criminal justice, criminal law, and criminology. Elective courses, which account for 15 credits of the online criminal justice associate degree, include terrorism and counter-terrorism, cybercrime, restorative justice, and homeland security. Students are also able to substitute nine credit hours in psychology for their elective courses. LeTourneau University is a Christian university. Applicants must submit transcript information as well as complete an online application. A resume is also required. Arkansas Northeastern College offers an online associate degree in criminology to students intending to continue on to a four-year degree in the field. The two-year program, based at ANC's campus, emphasizes criminal justice coursework within a broad liberal arts curriculum. In addition to preparing students for continued study, the program also provides students with the fundamentals of criminal justice needed to obtain entry-level positions in corrections, legal and political careers, or in local, state, and federal law enforcement. Coursework for the online associate degree in criminology degree includes juvenile justice, criminal investigation, and criminal law and procedure. The 60-credit hour program also provides students with the opportunity to take elective courses such as community corrections and police and society. Degree completion requires a 2.0 GPA or higher for all coursework as well as a "C" or higher in English composition, technical writing, and math. For admission to ANC, students must provide all transcript information, GED documentation, and ACT scores. Students must have a minimum ACT score of 15 in all three parts of the exam for admission to the program. The online associate of science in criminal justice and criminology at the Community College of Allegheny County in Pittsburgh, Pennsylvania, has three concentration options for students to pursue. Ranging from 61 to 66 credit hours, students can focus on law enforcement, corrections, or computer forensics. Coursework for each area is tailored to fit a specific aspect of criminal justice and criminology, although some of the courses remain consistent through each concentration. Students can take courses on police procedures, evidence and procedures, and ethics in criminal justice. The computer forensics concentration involves prerequisites in computer fundamentals and applications, and also requires a background check. For professionals interested in earning a criminal justice or criminology associate degree online, admission requires transcripts or proof of a GED, as well as complete a CCAC application. Students may need to complete placement exams, as appropriate. Saint Paul College in Saint Paul, Minnesota, offers a 60-credit online associate of arts degree with an emphasis in criminology to students who want to further their studies at the bachelor's level. Students in the program learn about the sociology and psychology of punishment, crime, and criminal behavior. They also explore criminal law, criminal justice systems, rehabilitation, and criminal justice policy. Core coursework for the online associate degree in criminology includes the sociology of crime and deviance, juvenile delinquency, and criminal justice, while electives allow students to complete courses in probation, parole, and alternative sentencing. The online degree prepares students to work as court, corrections, or police officers. For admission to the program, students must have a "C" or higher in English and reading prerequisites and may need to take exams for math placement. ACT scores can be applied to waive placement exams. The online criminology associate degree focuses on foundational coursework that provides you with the core skills and theoretical knowledge needed for entry-level jobs or for additional education. Classes often focus on sociology, psychology, political science, and chemistry topics. Many associate degree in criminology programs also emphasize communication, leadership skills, and computer literacy. As you conduct research on prospective online criminology associate degree programs, expect commonalities among core classes. However, advanced coursework, concentration options, and practicum or capstone requirements may differ based on the focus of individual departments and the faculty within them. Introduction to Criminology: This course provides an overview of the field, defining key theoretical concepts such as victimology, crime trends and statistics, and legal policy. Students who plan on pursuing baccalaureate or graduate degrees particularly benefit from this course. Constitutional Law and the Legal System: Students learn the history and legal processes of the American criminal justice system. Topics include due process, court structure, and criminal and civil procedures. The class usually emphasizes collaborative group work as students conduct in-depth analysis of important Supreme Court cases and contemporary challenges. This course caters to those hoping to pursue careers in law and law enforcement. Criminal Investigations: This class highlights crime scene and case management. Students learn the field standards and best practices that professionals must adhere to while overseeing a case. Police officers and investigators require criminal investigation skills to effectively fulfill their duties. Community Based Corrections: Not all aspects of the U.S. legal system involve jails and prisons; community-oriented services such as halfway houses, detention facilities, and rehabilitation centers offer effective alternatives. Students learn how to incorporate mental health, education, and work-release initiatives into the corrections process. Research Methodologies: This course teaches students to conduct academic research that aligns with field guidelines and standards, including how to draft a proposal, handle human subjects, analyze information, and garner support and funding. All criminal justice professionals, particularly those hoping to pursue graduate and postgraduate academics, require this training. How Long Does it Take to get an Online Associate in Criminology? Online associate degree in criminology programs follow academic conventions, requiring at least 60 credits and taking two years to complete. Many community colleges and four-year universities offer baccalaureate pathways where students transfer earned credits into a bachelor's program. Course structure and options for accelerated classes also affect the end date. While most remote classes operate asynchronously, some online criminology associate degrees require you to take courses one at a time as part of a cohort. This works well for adult learners who juggle school and work, but it also inhibits the freedom that an individually-paced learning structure provides. Practicum and capstone requirements also influence how long it takes to earn an associate degree in criminology. Many programs allow you to complete internships with organizations in your local community. Others provide intensive summer internships on campus or with a partner organization in their area. When researching online associate degree in criminology programs, look for those accredited at the national or regional level. National accreditation reflects official support from organizations working under the authority of the U.S. Department of Education (ED) and the Council for Higher Education Accreditation (CHEA). This stamp of approval means that these schools meet the academic standards necessary to receive federal financial support through ED. Colleges and universities earn regional accreditation from one of six organizations, each responsible for a region of the U.S. This kind of institutional backing also represents an adherence to certain guidelines for educational programming and student services. Because companies interact more directly with local and state authorities, some employers prefer regional accreditation. Online criminology associate degree programs sometimes earn official designation from field-specific organizations, such as the National Criminal Justice Association or the Academy of Criminal Justice Sciences. The U.S. Department of Education and the Council for Higher Education Accreditation grant certain organizations the power to accredit colleges and universities at the national level, giving them access to government funding and the resources and services of both organizations. As a federal organization, the ED aligns schools to the academic mandates of the national government. Founded in 1996, the CHEA advocates for standardizations among its more than 3,000 member schools. For more information, visit the ED's and CHEA's websites. An online associate degree in criminology prepares you for diverse career paths, such as police officer, judge, and forensic investigator. All of these occupations require attention to detail, effective communication skills, and the ability to discern key human behavioral traits. Successful criminal justice professionals possess the experience and wherewithal to apply theories, strategies, and practices in a timely and lawful manner. The list below contains five careers graduates often pursue. These professionals protect property and lives, working for state and federal government agencies as well as private organizations. They respond to calls and investigate criminal activities, pursuing suspects, interviewing persons of interests, and preparing a case for trial if necessary. In addition to obtaining a college degree, police officers undergo specialized skill and physical training. Often working for private organizations or their own practices, private investigators search for information on legal, personal, and financial matters. Their duties involve conducting background checks, finding missing persons, and investigating instances of fraud and cybercrime. Some states require them to obtain licensure on top of their academic degree. Acting as legal assistants to lawyers, paralegals maintain files, conduct searches for information, and draft documents to help the case. Depending on the size of the law firm or company, senior paralegals often take on information technology and management responsibilities. These criminal justice professionals aid investigation by collecting evidence and conducting laboratory analysis. They also secure the perimeter, take photographs, and reconstruct the crime scene to parse out details and clear up confusion. These criminologists protect the private digital information of individuals and organizations. They create and strengthen defense networks and security measures, respond to cyber attacks, and help track down assailants. Obtaining a criminology associate degree prepares you for some entry-level or practice-based occupations, such as legal assisting and general law enforcement. However, most careers in the field require a bachelor's degree that builds on the criminal justice theories and skills cultivated by a two-year program. By pursuing additional schooling, you open yourself up to opportunities for job advancement and greater pay. Paralegals stand to increase their salary by $4,681 when going from an associate degree to earning a bachelor's degree. They also set themselves on the path to senior positions, such as paralegal supervisor and corporate counsel. Bachelor of Arts/Science in Criminal Justice: This degree provides you with advanced study of fundamental criminology areas such as constitutional law and the workings of the American corrections system. Bachelor of Science in Homeland Security: This degree trains you to respond to natural disasters and human-made catastrophes, such as terrorism. A homeland security degree also trains you to secure borders, airports, waterways, and other entry points. Bachelor of Science in Forensic Science: Building on core practices in criminal investigation, this degree arms you with the advanced forensic chemistry and biology skills necessary to conduct in-depth analysis of case evidence. A forensic science program usually entails substantial lab work and practicum requirements. Bachelor of Arts in Political Science Pre-Law: A baccalaureate degree in political science teaches you the theoretical and historical knowledge needed to pass the bar exam and pursue a career as a lawyer, judge, or community activist. Bachelor of Science in Cyber Security: Drawing on information technology topics in the criminology associate degree, this degree trains you to protect sensitive online data. Professionals in criminology and related fields increase their salaries through job experience or by garnering additional academic credentials and skill-based certification. Careers like legal assistance and law enforcement only require an associate degree in criminology, so job advancement increases with hours spent in the field. Other criminal justice careers, such as those in forensics and homeland security, necessitate a baccalaureate degree or higher, but offer better salaries. The following table details the growth of five popular criminology careers using data from Payscale. Students pursuing an online associate degree in criminology increase opportunities for funding, networking, and internship/career placement by joining professional organizations. Aside from providing job boards and facilitating conferences, a criminal justice organization also promotes communication and collaboration among its members. For example, the National Criminal Justice Association's Connect2Justice initiative offers a way for you to establish yourself as an innovative and noteworthy professional. Academy of Criminal Justice Sciences: Established in 1963, the ACJS promotes policy analysis and education in the field. Members enjoy access to academic scholarships, research grants, and academy publications. The ACJS also holds annual conferences and frequent meetings. American Society of Criminology: The ASC focuses on the study, prevention, and treatment of crime and delinquency. In addition to its annual conferences, the ASC provides members with professional opportunities through research funding, publication, and career guidance in the form of an employment exchange. National Criminal Justice Association: As one of the most influential criminal and juvenile justice organization in the world, the NCJA conducts research and promotes policy changes within state, tribal, and local governments. Members enjoy access to funding, discounts on conferences, and up-to-date information on new practices and strategies. National Organization for Victim Assistance: NOVA fights for victims' rights through policy advocacy and educational programming. Members receive specialized training, attend conferences, and engage with NOVA's Leadership Center, which provides valuable professional development experience. American Academy of Forensic Sciences: With more than 6,600 members, the AAFS stands as the leading professional organization for forensic specialists. In addition to facilitating research initiatives and networking events, the AAFS also provides support for students, such as summer camps and career resources. Find online associate degree in criminology programs that match your professional interests and career goals while maintaining a realistic sense of the costs. The Free Application for Federal Student Aid (FAFSA) provides a convenient method to compile scholarship, grant, and loan opportunities. Additionally, search for awards from community programs and organizations of interest, such as scholarships offered by the Academy of Criminal Justice Sciences.